Which ingredient most influences a hifi system’s sound quality? The instinct-driven first responder might first point to his loudspeakers. But no. For those who don’t think they all sound the same, amplification might get the nod. Nope. Source-firsters (aka flat-earthers) will probably opine that it’s the DAC and streamer or, in the analogue domain, the phono stage, turntable and cartridge that make the biggest differences. Again, close but no cigar. A room’s size, including ceiling height, can colour more of what we hear from the listening position than the loudspeaker or its upstream electronics. For an apartment, a two-way standmount might be a better acoustic fit than a multi-driver floorstander. Transplant that same standmount to a larger room and it will work a good deal harder than a floorstander in generating a sense of physical presence. The loudspeaker must be matched to the room…and larger rooms open the door to more possibilities. We might be tempted to think therefore that bigger is better. Until we factor in the room’s material make-up. Hard surfaces cause reflections. Reflections can wreak havoc with the listening experience. Keeping things simple atop this reviewer’s Berlin apartment shopping list were “carpeted floors”. Alas, the first hard truth to learn about Berlin apartments is that fitted carpets are rarely seen. 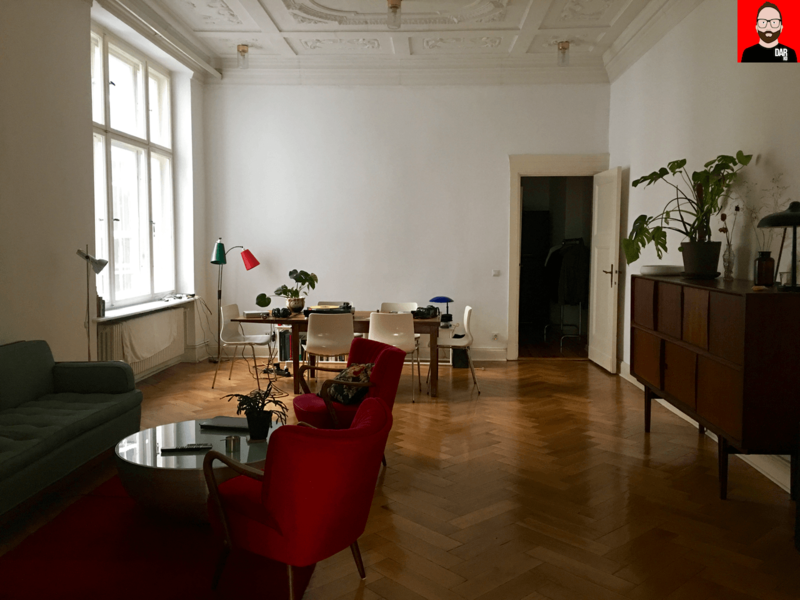 My temporary Airbnb rental is an enormous first floor apartment in an Altbau (‘old building’, pre-1949) in West Berlin’s Charlottenburg-Wilmersdorf district. The lounge room alone runs 10m x 6m. A 4.5m high ceiling adds to the sense of space. Floor-to-ceiling sliding doors open into a bedroom that adds another 6m to the long wall. The whole place is nicely decked out with vintage furniture. A dream home for many a Berliner. But in every dream home, a heartache: this loudspeaker-loving audiophile could never live here. Instead of a carpet we get a parquet floor – easy on the eye, tough on the ear – which, in tandem with high ceilings and minimal furnishings, transforms the space into an echo chamber. A generous helping of rugs would alleviate some floor-borne reflections, but not entirely. It gets worse: in the guest book, a warning that playing the apartment’s B&W Zeppelin speaker too loud would disturb the neighbours above (“especially the bass”). Acoustically treating the ornately-patterned ceiling would be an aesthetic crime, not to mention wholly impractical. Sonic disturbances are a two-way street. I hear each and every one of the upstairs’ neighbours footsteps. Especially at 4am. The folks below likely hear the same from me. According to one new acquaintance: Berlin isn’t as laissez faire as its reputation might first suggest. Twenty years of gentrification apparently now puts the once nightclub-heavy Prenzlauerberg and its neighbourhood noise tolerance to bed at 8pm. Only screaming babies get a daytime pass. Hifi systems working on thin floors apparently do not. Not ever. A paper-thin floored/walled Alt-bau is apparently fairly typical for Berlin. So says property expert Sabine Engelhardt of relocation agency Move to Berlin. Engelhardt has been charged with helping me find somewhere more permanent. With a 4-week clock ticking down on the Airbnb rental, time to beat the Berlin streets with the most convivial Engelhardt in search of something better suited to an audiophile. But first, a couple of mis-steps as we find our feet. 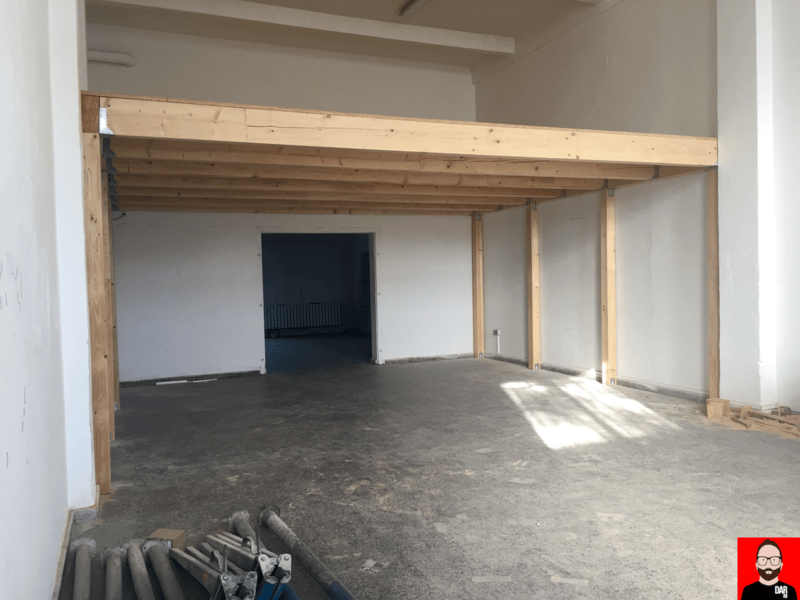 The first stop is a very large studio in Charlottenburg. It’s bright and airy but the ‘his n hers’ bathrooms lend the place an awkward feel. The floor feels solid enough but neighbours above and below make it a risk to hope they work elsewhere during the day. Next up, something from the leftfield: a former factory in Weissensee that is slowly being carved up into artist ‘spaces’. Photographer Stephanie Schneider has her studio here. On-site manager and professional cigarette smoker Herr Pettr walks us through several possibilities. Catch number one: putting the dust in industrial, even the smaller spaces retain a warehouse vibe. Pettr’s places provide an indication of what’s possible when thinking outside the in-town apartment box but they are workplaces first, homes (a distant) second. Catch number two: the option to play music as loud as one likes at almost all hours has infinite appeal but exten$ive room treatments would still be called for. There’s that heavy echo here. Catch three: despite fitting a loft-like platform for a bed, Pettr would have to (officially at least) turn a blind eye to any tenant sleeping on site. A basic kitchen and bathroom would be installed upon receipt of deposit – but to what standard? Catch four: Price. €900 for up to 80 square metres. 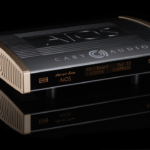 €1400 for over 100 – the latter better suited to the kids from Fame than an SPL-pushing audiophile. Time for Frau Engelhardt and I to sharpen this newcomer’s special needs. A top floor apartment would slice the potential to disturb neighbours (and them me) in half. A fine idea but according to Engelhardt, top floor apartments come at a premium. I remain keen despite the additional cost. Non-negotiable too would be a fitted kitchen. Many German apartments come without. Tenants must foot the bill of installing their own. If a kitchen is present, the outgoing and incoming tenants either cut a deal for ownership transfer (or it gets ripped out). Either way, this adds Euros in their thousands to the total cost of renting an apartment. I was after somewhere with a fitted kitchen but included in the monthly rental price. Another premium to swallow. If I’m moving to Berlin, I want to live in Berlin, not on the inner-city’s periphery. Talk of tourist attractions like Checkpoint Charlie and Brandenburger Tor might cause the average Berliner’s eyes to roll with over-familiarity. But not mine. Next up, an “architecturally overhauled” top-floor maisonette in Prenzlauerberg. The neighbourhood (‘Kiez’) was beyond charming and remains the pick of all that I saw before or since. Inside the apartment itself, a decent sized lower level with the typically creaky, cardboard-thin floor. If located on the level above, the loudspeakers would less likely disturb neighbours. 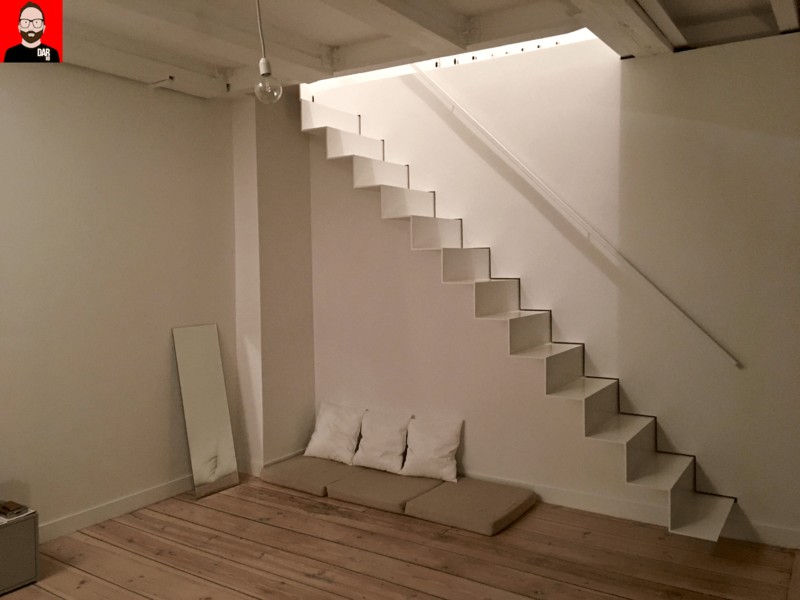 An attractive, bannister-free staircase chimed with the minimalist fit-out but also cut a significant hole in the usable floor space above; insufficient width for proper loudspeaker spacing, even less for a couch in front. A second floor cut out on the opposite side of the staircase pushed the possibility of losing a standmount loudspeaker to the level below above zero. Yeah nah. 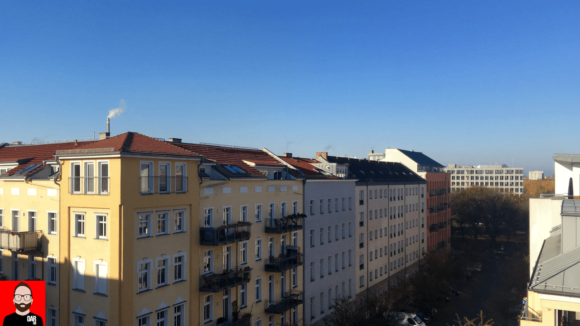 Staying in the East, a top floor, single storey apartment within spitting distance of Alexanderplatz offered narrow balcony views to the north from the bedroom and the south from the lounge room. The latter benefitted from non-parallel walls and high ceilings. A contender at last. Then came news that competition for securing this place would be fierce and that a SCHUFA (local credit history report) was required for my application to succeed. This administrative roadblock as well as an abundance of other interested parties quickly blunted my sharpening interest in an apartment in nearby Mitte. Just north of the river Spree, the views across rooftops from its wraparound balcony were stunning. The rental scene here moves quickly and, according to Engelhardt, demand consistently outstrips supply. That means prices are heading north at a fair clip. 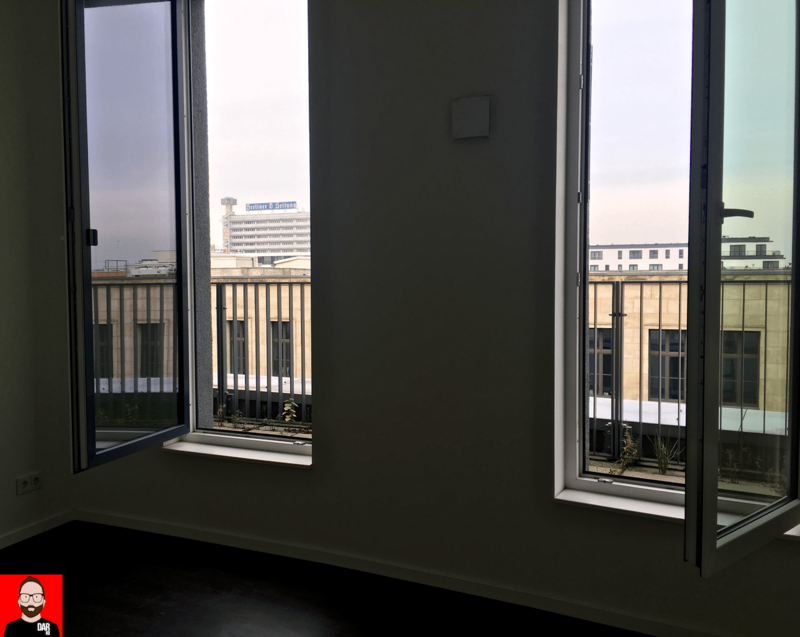 Cast a beady eye upon anyone telling you that renting in Berlin is super cheap. It isn’t. 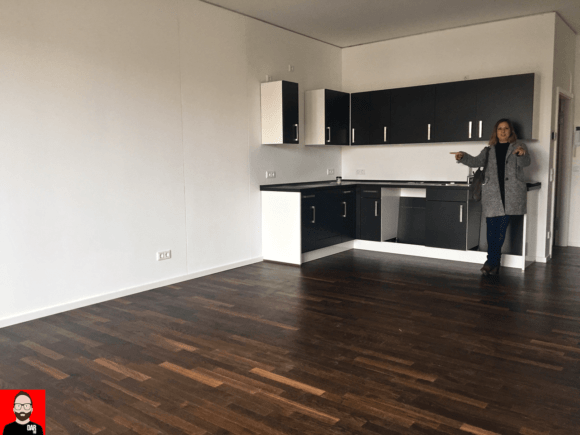 This Alexanderplatz-proximate place is yours for €1450/month. Ditto the aforementioned Prenzlauerberg joint. A ballpark figure of €1500 (‘warm’ – with heating and hot water included) was being asked for what would be the penultimate destination on Engelhardt’s viewing tour. 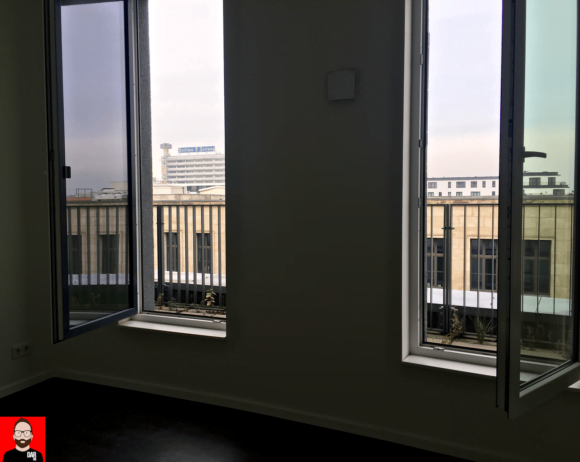 Above the Mall of Berlin at Potsdamer Platz, rental apartments are being released in stages. The place being inspected by yours truly ticked the square meterage and room layout boxes. So too did the retail store below. Bringing us back down to earth though was the outlook: a car park and a concrete block of a housing estate. Berlin winters are grey enough without adding to the bleakness. Having neighbours above moves us from the top floor ideal which itself poses the potential for neighbourly disharmony below. 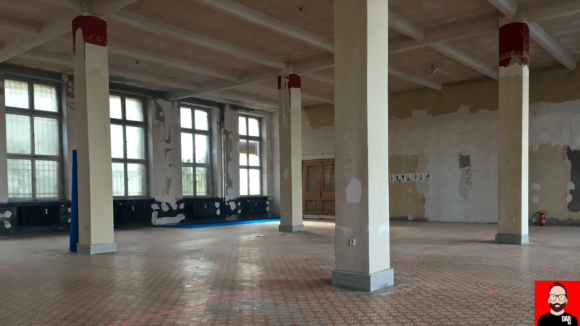 How about a top floor maisonette in a Neubau (‘New building) where offices occupy the six floors below? Concrete floors? Check. 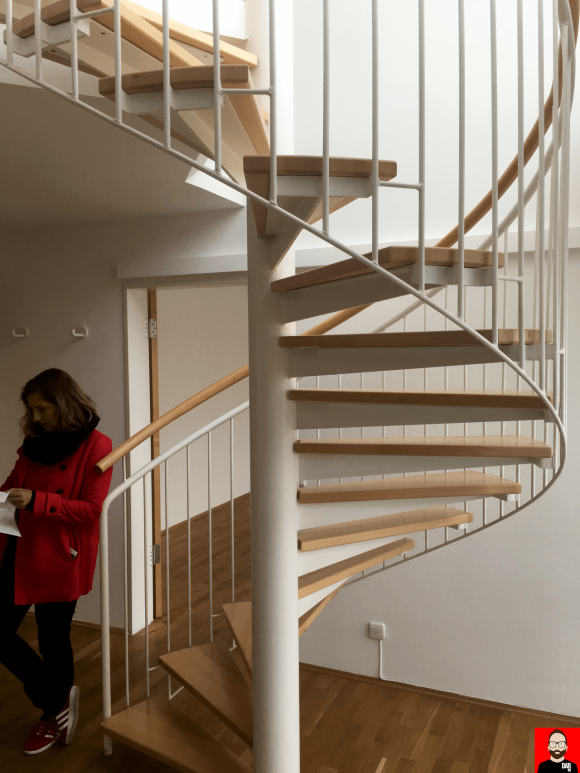 Inside, a spiral staircase takes us upstairs to a landing that splits bathroom from bedroom. The room roles could easily be reversed in the unlikely event of noise complaints. A balcony runs the length of each floor. Downstairs, the kitchen comes fully fitted and without additional hassles (or upfront costs). Location? One block from Gendarmenmarkt and the Deutsche Dome. At the end of the street, Friedrichstrasse. No SCHUFA required. Engelhardt handling the transaction and paperwork, a DARHaus has been secured. Apparently, doing so in only three weeks is unusually fast. More info to follow once a basic furniture kit out goes in next week. 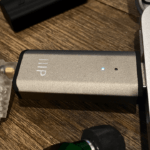 Next article MonoRice 1X USB DAC – grand theft audio? Indeed, and a great advert for headphones if ever I read one. All the best, Herr Darko…ooh, and don’t mention the war…I did once but I think I got away with it. I’m glad to hear that it all worked out. (But it’s giving me some jitters as to my future plans… I have the same requirements.) That’s a rather swank area, no? I guess living on top of a retail establishment could have been another option as well. Anyway, it may not be a hot zone, but I would also give it all up to be able to listen to the stereo. Now it’s time to get a bicycle. ditto, good read! wishing you the best with your relo. The plight of the city dwelling audiophile. Adding the A to the big three ‘L’s of real estate. Location, location, location and acoustics. There are a few issues with apartments and hi-fi. Something I noticed recently is that the hi-fi sounds worse when the neighbour’s TV is on, which is on the other side of the wall. I can’t hear their TV but I have a radio meter which takes any low level frequencies and converts them to audio and I can actually hear what they are watching. I’m not sure how that is possible, is the TV using a class D amplifier? Modern apartment blocks can have extra noisy electrical equipment attached. The first was quite bad. The second was fine during the day but some motor or something would kick in at 6pm and stop at 6am, generally when I would want to listen to the hi-fi. There was a distinct change in sound. I could hear the buzz over an AM radio. I believe it is caused by PWM-controlled motors but I’m not sure for certain. You almost need a forensic kit when checking out apartments and townhouses. Thank you, Kees. Very kind. Will holler if I need help. Hi John, congratulations to your new HQ. 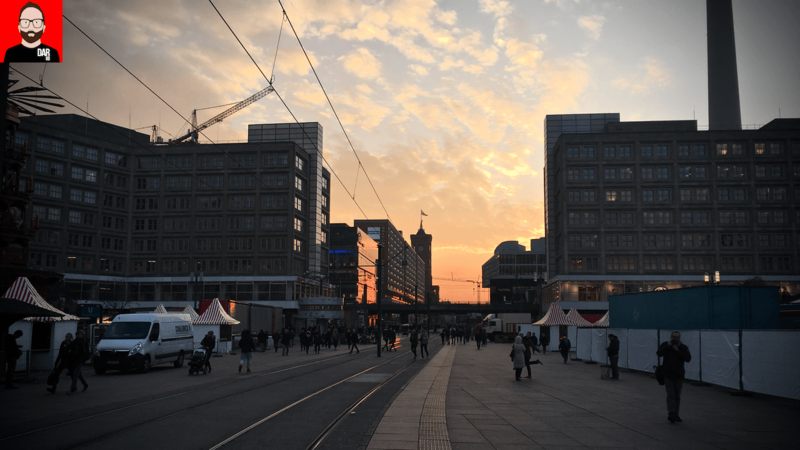 I would love to read more about Berlin from your (not only audiophile) perspective. Great piece, John. An object lesson in persistence, and how to adapt to a wholly foreign (yet, in the mind, familiar) city and its way of doing things. A thought: No wonder Berghain is open from Saturday to Monday – no one can listen to techno at home! Congrats on your new flat! Glad that you found something that fits all your needs. Nice read as well. It reminds me of my flat search Frankfurt some years back. Good read. Looking forward to some pictures of your apartment and listening space. Nice article. Even in a first-world country like USA, most apartments are sound-proof only to third-world standards. A neighbor in Milwaukee used to give me hell for the subwoofer, so I had to ditch having speakers for a while. I just don’t enjoy music without a sub. The Facebook group “Free Advice Berlin” is littered with advice sought re. 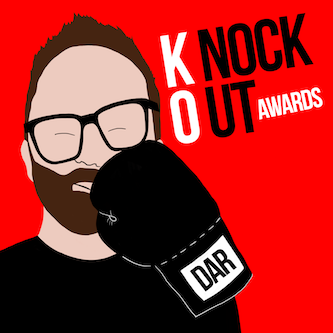 noise complaints…and from both sides of the argument: perpetrator and sufferer. Glad to hear you are making progress. My dark side was almost rooting for a sub column of the audio scene amongst under-bridge dwellers. IKEA delivery lands on Thursday. And you’re bang on, Srajan. Moves are expensive. International moves that involve airfares, a month’s temp accommodation and a three-fold increase in rental deposit are financially off the dial. Financially off the dial but….priceless. I made the leap from London town to Perth, WA. Sure I miss the Big Smoke but it’s still there to visit and Perth’s got beaches that I’ve dreamt of all my life. Well done, Darko; it’s a big move but I feel you’ll thrive in Europe. So you won’t be carrying a pair of Diatone DS-5000 speakers up the spiral staircase (87kg each). Your flat hunting seems to have gone remarkably well. I remember when I first moved to Sydney from blighty, the wife & I started to realise outer city living gave us low rents and more space. We lived in a 1 bed flat for 6 years in Perth prior to the move back to Sydney. Neighbors have never complained so pretty happy. On the bright side, changing residence from one country to the next, for the right people, is a lot more rewarding than a 3-week holiday in some exotic location. And if you end up tiring of Berlin, you can always do it all over again. Now that you’re on the continent, the next move can be by lorry at least for your belongings. Yes, I can’t imagine German insurance companies will care about my 10+ years of claim-free driving either. Still, no car for me here in Berlin for a while. New place is slap bang between U2, U6 and U8 (I think) and Friedrichshain, Neukölln and Kreuzberg are all walkable. And with all the walking I’ve done in the past 4 weeks, I’ve likely seen as much, if not more, than your average vacationer. As you say, living in a place is the only way to get to know it. And if Berlin’s cold, grey winters become too much, there’s always Barcelona. Olé! Ceiling height. The reason why I had to give up on desktop audio. I now can only tolerate headphones at my desk, and speakers in a serious listening room lower to the floor. For that very reason and more, DAR’s new HQ is a Neubau with a more standard ceiling height. first of all I wanna welcome you and wish you the best of lucks in this amazing and vibrant city, I moved here 5 years ago and I am not looking back, actually my audio hobby started here and I learned a lot from the local dealers and to sites like yours. the volume past 11 o’clock works for me. Thank you for the warm welcome, David. Great story, it is always interesting to read about other people’s experiences in this city. Congrats from Potsdam. Love your site for witty writing and sneaky musical references in addition to common sense re all things audio. Recall a college buddy adapted the lyrics of In Every Dreamhome a Heartache by Roxy Music into a short story about prominent surgeons having monthly parties together with their inflatable doll like lovers. I’m delighted that I’m being read by people, such as yourself Fred T., who pick up on precisely on what I’m laying down. You’re right: my reviews are peppered with sneaky references to lyrics and albums titles, usually by artists who I seriously dig. MonoRice 1X USB DAC – grand theft audio?